A game that I had never heard of prior to GenCon was Stomple . Fortunately for me, I walked past their booth, and the game looked interesting enough for me to try a demo of it. In Stomple, 49 marbles are laid out on a 7x7 grid. Each of the marbles carefully rests on a foam inset, and the board is placed on top of a wooden "holder" (for lack of a better word - it catches all of the marbles when they fall through the hole that they are resting on). After the marbles are randomly placed, each player randomly selects one "Stomple", which shows a marble color on top, and has a base that fits into the same place as the marbles. Unfortunately for the marbles. On the first turn, a player takes their Stomple, starts from the edge of the board, and "Stomples" (the box says Stomp, but what does a Stomple do? Stomple, of course) a marble; and if that marble is adjacent to another marble of the same color, they Stomple that one. And the next one. And the next one. Until they have Stompled all of the adjacent marbles of the same color. On the second and all following turns, a player can either continue Stompling (in the same manner as on the first turn) any marbles that are adjacent to him, or he can "Hop" to another marble of his color to get better positioning (thus Stompling it and ending his turn). The object of the game is to be the last Stomple standing when no other player has any moves that they can make. And at that point, you score points based on how many marbles are left. Then you play again. And again. Until you get to a certain number of points. Then you declare a winner. And play again. So, the first pro to Stomple is that it is incredibly fun. The back of the box states that it can be addictive, and I would tend to agree. Sure, it is great to win the game, but the physical act of Stompling the marbles is fun as well. And the game itself lends to a lighthearted atmosphere where friends can simply get together and enjoy each others' company while playing a fun, high quality game. Speaking of enjoying people's company, Stomple's next pro is that it can really be played by just about all ages. I could see friends playing this with each other. I could just as easily see parents or grandparents playing this with their children (and grandchildren). The rules are straightforward enough that anyone should be able to master them, and the act of Stompling I think will appeal to children, motivating them to ask to play the game (and yet the game won't be annoying to adults). The third pro for Stomple is that it is a beautiful game. I have at least one friend that will buy games that he can set out on his table because they look pretty. Unfortunately, when he does this, he often winds up with games that are gorgeous, but aren't very good as an actual game (I'm glad that at least he isn't buying dozens of fancy chess sets). Stomple would make a good game for this - with the quality of the wooden board and the marbles (and even the Stomples), the game would look good if you left it out for decoration. A neutral point of note before getting to the cons: I'm not really sure how long the board itself will last. Since the holes that the marbles are pushed through are made of foam, I don't know how long they will last in terms of both years and plays before they will wear out. This is important to me, as I can see this being a very good game for grandparents to have in a game closet that can be pulled out whenever the grandchildren are visiting. And, if that game closet is anything like the game closet in my Grandmother's home, then those games will be in there for a long, long time - and so I would hope that Stomple could last that long. Unfortunately, there are a couple of cons with Stomple. The first of which is rather trivial. Stomple is a very noisy game. This isn't really very true when playing the game, but when setting up the board, and when transporting it in the car, the marbles roll around a lot and ram into each other. Again, this isn't really a major indictment to the game, but it is something to be aware of - make sure that you plan on playing it in a place where some occasional loud noises won't get you kicked out (stated another way, "this is not library friendly"). A more significant con to Stomple is that it feels like there is too much luck in the game. 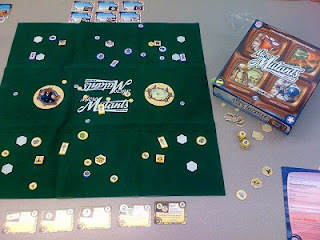 Now, with that said, there really are only two random parts to the game: the setup and the selection of the Stomples. However, if you start the game with most of your marbles in a continuous line, you will be at a very significant disadvantage in the game. The other aspect of the game (and why it "feels" like luck instead of actually being luck) is that in a large game, you don't have very much control over your chances of victory. When playing six-player, the board simply is too small to allow everyone to have many movement options - and so it is very easy to eliminate players; and to be defeated no matter what your "strategy" might have been. Because of this, I think that as a "strategic" game, Stomple is probably best with 3-4 players. (As a fun game, however, Stomple truly is fine with 2-6). Overall, I give Stomple an 8.0/10. I'm glad to have added this game to my collection, and I really think that it will continue getting playing time. I would recommend this game to anyone that likes abstract reasoning games, but I would highly recommend this game to anyone with children that enjoy playing games. I would like to thank Stomple's designer Greg Zima of GaZima Games for providing me with a review copy of Stomple to play. Normally in reviews of expansions, I write about the major changes that are introduced in the set. However, since the Master Set doesn't really change anything about the rules of Summoner Wars (at least, not that I noticed), I will instead focus on the races and contents of the box. I am assuming that you have already read the original Summoner Wars review that I linked to, and I will not be rehashing the pros and cons of the Master Set (since they are the same) as I normally do in my reviews. The Master Set includes 6 races (who will be addressed later), the premium gameboard, and is setup to be able to easily hold all of your armies. What's more, it has all of this for only $50. Previously to get into Summoner Wars, you had to buy a two-player starter set for $25, which came with a fairly pitiful fold-out game board (and to buy the premium board you had to pay another $15). Plus, to get more armies, you had to buy faction packs for $10 each. Therefore, to get 6 armies and the premium game board, you were looking at paying $80. And now, it's only $50. Right there, I could already stop writing this review (and assume you read the original review already), and you should all be convinced to go buy the game. Instead, for your reading enjoyment, I will write about the races. Mountain Vargath: This race (looking somewhat like minotaurs) is the most straightforward, easy race to play with. Play lots of units, charge, pound on your opponent. Most of their units have abilities that are pretty easy to capitalize on; abilities that do things like give you an extra die when you're attacking on your opponent's side of the board. Like I said, get close and pummel your adversaries. I really enjoy using this race, and it is also very convenient to give to a new player. Deep Dwarves: This race could also be known as the Magicians. Most everything that they do causes you to use magic. Fortunately, their Summoner has a special ability that allows them to take the top card from the Discard Pile and put it on your Magic pile (but then you can only use one unit to attack that round). They have a bit of a learning curve in seeing how they can fit together, but once a player learns to use them, they can be incredibly effective. One of their units (Scholar), specifically, has a Strength of 0. However, for 1 Magic, you can cause every unit that attacks an enemy that happens to be adjacent to a Scholar to attack with an extra die. Therefore, they are able to attack with 1 if you use their ability (since, by definition, as a melee unit they are adjacent to whoever they would be attacking) - or, more usefully, your other units are able to attack with 2, 3, or 4 dice. This is a quick way to slaughter an opposing Summoner. Benders: Also known as "Sheer Awesomeness in a Bottle" (my term). First of all, you must make sure that nobody ever gets very close to your units - none of them are melee, and they all have hitpoints in accordance with that (such as Champions with 3 or 4 hitpoints). However, they are all able to attack at range effectively, and their abilities are phenomenal. Things like Stun, "Common enemy Units that begin a turn adjacent to this Deceiver cannot move or attack during that turn." One Champion can also force a Common units to attack twice in a turn. And another Champion can capture any opposing unit that he dealt the final blow to (even Champions!). These guys can be a lot of fun to play. Sand Goblins: This is an interesting mix of what you would expect traditional "Sand People" and Goblins to do. For example, they have Camouflage, which states "This Javelineer cannot be attacked by non-adjacent Units." That is fairly standard for a "Sand Person." However, they definitely have a Goblin flavor; one of their Champions, accurately named "Biter" has an ability called "Crazed" which doesn't allow him to move if he is adjacent to an enemy. Another traditional Goblin character is the "Scavenger", which takes destroyed cards and puts them under himself as protection instead of sending them to your magic pile. These aren't my favorite race to play, but, they can't all be favorites, or it loses it's meaning, now doesn't it? They are still a very solid race. Shadow Elves: Who said that elves were wimps? Oh right - most fantasy books that I have ever read say that. Fortunately, these Elves come with their friend the "Hydrake", which destroys everything. Everything. He has 3 attack dice, but he can attack each enemy unit that he is adjacent to. Oh, and he also has 8 health. As for the rest of the Elves, they have some interesting abilities but the general strategy is to hang back and shoot at your opponents - and choose the most opportune time to charge in and strike. They are well designed to truly have both a traditional "Shadow" and "Elf" feel to them. Swamp Orcs: Last but not least are the Swamp People. They have a special card called a "Vine Wall". This annoying thing (my opponent normally plays with this race instead of me - hence things that they are able to do are very annoying) starts sprawling it's way across the battlefield. This serves two purposes. First, Swamp Orcs can be spawned just about anywhere (after all, there are Vine Walls everywhere, and you only have to spawn next to a Wall). Second, it drastically hinders the movement of all other players (who have to roll to move their units across Vine Walls), while improving the abilities of the Swamp Orcs (they often get bonuses for being adjacent to a Vine Wall or for moving over a Vine Wall). This is a very interesting new way of strategizing in Summoner Wars, and because of this I am very pleased that they were included in the set. 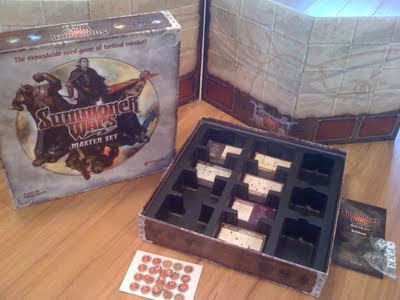 Overall, I give the Summoner Wars: Master Set a 9.0/10. If you love Summoner Wars (and if you don't, why did you really read all the way down to here?) then you should definitely look to buy this set. It is definitely worth the money, and it is also a very good way of storing all of your old Summoner Wars sets (though the box is a bit bulky). I would like to thank Plaid Hat Games for providing me with a demo copy of the Summoner Wars: Master Set. So, I feel like it's only fitting to start this review with a confession. I had absolutely no interest in playing the next game. I had read a review or two about it, and it really didn't seem to be something I would enjoy. In fact, when I was talking to Michael Mindes (owner of Tasty Minstrel Games) at GenCon, I was very reluctant to even accept a demo copy of it. The game I'm referring to is Jab: Real-Time Boxing . In my previous experience, "Real Time" in board games is normally synonymous with "horrible". Fortunately, I did accept the copy from him, and this allowed me to write the rest of this review (which, of course, I feel is definitely worth reading)! In Jab, each player represents a boxer that is attempting to defeat his opponent - either through a knockout, or through winning three rounds by judge's decision. Each boxer is represented by three cards; a head, left side, and right side - each of which can be punched by your opponent. Each player will also have two piles of punch cards in front of him (one in front of his left hand, one in front of his right) - and he must play the cards from the appropriate hand (for example, right side pile with the right hand). When landing these punches, a boxer is looking to do a number of things: stagger his opponent by landing a Haymaker follower by a punch of the same color (this steals 2 health from your opponent), counter-punch by having a punch of the same color on each player's stack (this is worth 2 judge points and steals 1 health from your opponent), or by landing combos (such as Jab, Uppercut, Cross) by having each of the punch types listed on the current combo showing on your opponent (this is worth judge points at the end of the round). You can also block your opponent's punches by playing cards of either the same color or type on top of the showing card (for example, if they have hit you with a Red Hook, you can block it with any Red card or any Hook card - or you can block a Haymaker with any card). Once players run out of cards, the round ends and judge points are tallied - with the player gaining the most points winning that round (assuming nobody was knocked out). If a player runs out of health and then takes more damage, he can be knocked out, thus immediately ending the bout (and causing massive amount of trash talking). The first pro to Jab was that there really was strategy in a "real time" board game. I must admit that I didn't really expect this, as most "real time" games seem to only be about how fast a player can burn through his pile of cards. However, with the fact that you can win both by judge's decision and by knockout means that you have to pay attention to multiple things at the same time and make sure that you play a balanced game. If one player is focused solely on judge points, he can find himself knocked out before the three rounds are over; conversely, if a player is focusing only on the knockout, his opponent can fairly easily defeat him by playing a little bit of defense and winning the judge decisions. The other aspect of Jab that works very well is that there are enough things going on in the game to force you to be scatter-brained, but not so many that you can't possibly pay attention to all of them. Here are the primary things you will need to focus on: going for a combo, landing haymakers, preventing your opponent from landing haymakers (and possibly blocking a few other punches for good measure), watching your health, and scoring counter punches. Sound easy enough? It's really not. I think that if much more was introduced to the game, then it might become cumbersome - I think that the designer did a very good job of adding enough to the game to make it a challenge, without adding so much that it was unnecessarily complex. The next point is more of a neutral aspect to the game. Both of the boxers are the exact same. I think it would have been interesting to have an "advanced" mode in which the players were able to choose from different boxers that actually had different characteristics. Perhaps one that took three health instead of two when staggering an opponent, but that loses 5 judge points each round. Another one that gets bonus points for combos. One that staggers an opponent for one health each time he plays a haymaker (but a stagger does nothing). One that gains health whenever he blocks a haymaker. Obviously, I haven't playtested any of these things, so I don't know if they would work very well, and I especially don't know if they would keep the game balanced, but I think it would have been an interesting thing to add even more replayability to an already high quality game. (And so, if the designer or publisher is reading this, it might be a nice little expansion opportunity - all you would need are extra boxer "heads" that told you what the ability was). Now for the first (and biggest) con for Jab. It's really hard to teach new people. By this, I don't mean that the rules are especially complicated - in fact, my summary at the top covered around 75% of them. What I mean is that after I've played the game a few times, I may not be great at the game, but I'm going to be much better than a new player. And so, if I teach a new player (and then completely destroy him so that he runs crying to his momma… you know, after he regains consciousness), it is hard to figure out how exactly to let them play the game and feel competitive. If they don't feel like they have a chance, then they are not going to want to play the game again. There may need to be some official "handicap" rules that are implemented in games involving newcomers. 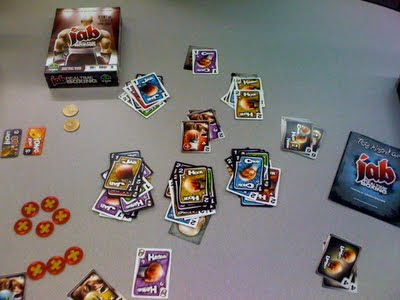 The next con for Jab was that, as with any game in which you and your opponent are reaching across the table at each other as quickly as possible, you get in each other's way. Now, from what I have seen, this doesn't actually start happening until you and your opponent start getting pretty good at the game (because that's when you start playing faster). And, honestly, it doesn't happen nearly as often as I was expecting after initially reading the rules. Nevertheless, you will inevitably have a collision mid-air over the table at some point, in which you will need to pause and re-set the game so that the card that was in your hand and went flying across the room can actually be placed in a valid location. This doesn't happen very often, and is actually somewhat amusing when it does, but it is still inconvenient. Overall, I give Jab: Real Time Boxing an 8.0/10. I would never have thought to buy this game. And yet, if I had, I would have been quite pleasantly surprised, and I would have thought that it was worth the money. I would recommend that if you have the chance, you try this game - it won't be a perfect fit for every player, but I think that most of you will be quite pleasantly surprised! And, as a final passing thought as I conclude this summary - it might be really fun to play this against one of your normal opponents that suffers from "Analysis Paralysis" (taking forever to take their turns because they have to weigh their options for hours on end). It might help you relieve some of your aggression as they get slaughtered for taking forever to play! I would like to thank Tasty Minstrel Games for providing me with a review copy of Jab: Real Time Boxing. A game that I've been trying to find for about six months (since the designer was kind enough to point it out to me and I thought it looked intriguing) is Train of Thought . 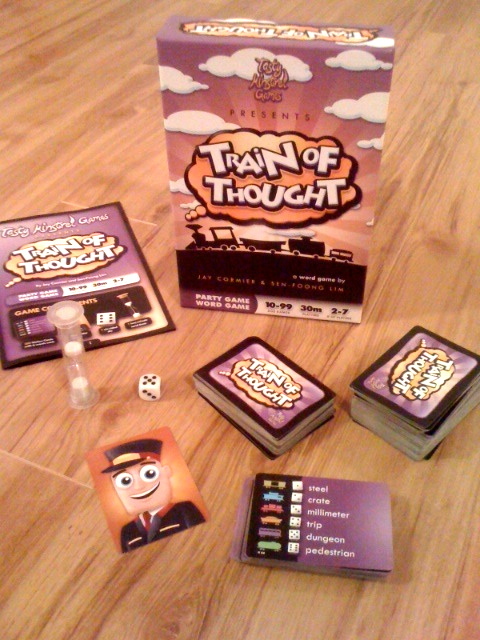 In Train of Thought, players take turns playing as the "conductor". The conductor rolls a six-sided die and draws a card - this gives him a starting word (like "House"). From there, he draws the next card, which gives him his destination word (like "Experience"). Now, he uses the starting word along with two other words to attempt to get all of the other players to guess the destination word. If they don't get it on their first try, he can choose one of their words as his new starting word, and try again. Once you finally get them to guess the right word (this may be very quick, or may be an excruciatingly long time), you draw another card, and use your previous destination as the new start word. For each word that is correctly guessed, both the conductor and the person to guess the word get a point in the form of a card being played in front of them. You normally allow each player to be the conductor twice, and then whoever has the most cards is the winner! The first thing that I like about Train of Thought is that it breaks my brain - and in a good way. Let's go ahead and admit this. My brain is incredibly analytical (some would say that I'm "overly analytical", but I prefer "super analytical", because then it sounds much more like a super power). And, yes, in case you didn't read between the lines, "super analytical" does equate to "software developer", which is what I currently do that actually pays "real" money (as opposed to blogging). With that, creative word games aren't necessarily something that come naturally to me. Train of Thought, specifically, challenges me to think in much different ways than games like Taboo , where I can keep babbling until someone figures out what in the world I'm saying. I only get three words, one of which is provided for me (and normally irrelevant) - I better make them count! The next pro is that the game can have some really neat connections to lead from one word to the next. This is, honestly, the best part of this game and what sets it apart from any other word games that I have played. One of the games we played saw a connection from (I think) the word "weight" to the word "skin". The connection went something like "this covers weight"; which led to guesses of "clothes", "scale", and a few others. To which, the conductor (not me) cunningly replied "scale to dragon". Brilliant! Of course, scales to a dragon are their skin! When things like this occur in the game, it really helps you enjoy the game, and reminds you why you are playing it instead of any of the other multitude of choices in word party games that are available. Unfortunately, when people choose not to play by the "spirit of the rules", the game still functions, but prevents you from experiencing the previous pro. The only real requirements of the game are that: first, you only have three words, and second, that you have to use a certain one. However, if your starting word is "Sunshine" and your destination word is "Shield", there's nothing to stop you from giving "Sunshine Captain America" as a clue. In fact, this is a pretty effective strategy, and if your goal is to win, there's no real incentive not to use it (people will catch on and disregard your first word). And I can't really point fingers here, because I have also found myself in a bind, unable to find a connection from one word to the next and thus defaulted to this strategy. I think the game would be more fun with a house rule that you are not allowed to do this - even if that requires you to all agree that you don't even keep score (those of us who are a combination of hyper-competitive and really bad at this game would probably not agree to this house rule otherwise). The next con is in the limited number of cards included in the game. Whereas there are 200 cards, and each card has 6 different words on it, we wound up reusing some of the same words the third time that we played the game. Now, this was a combination of playing with psychologists (they are great at stringing words together to allow people to figure out what they're thinking and thus scoring lots of point - and going through lots of cards) and some similar dice rolls (we never rolled a one - in either game; we rolled a lot of five's), which led to the duplication. However, it still would have been better to have more cards available to keep the game fresh, without having to give it more down time between games (so that we can forget all the words). Overall, I give Train of Thought an 8.5/10. I eagerly anticipated trying this game for several months, and it didn't disappoint. I think that this is a new take on word games, and I look forward to getting to play it more often. Unfortunately, it will only be once every few weeks, at the most, to make sure that we don't remember all of the words. I would like to thank Tasty Minstrel Games for providing a copy of Train of Thought for me to try. I would also like to thank Jay Cormier (the designer of Train of Thought) for pointing the game out to me. If you're interested in following his adventure in getting games published, check out his blog Inspiration to Publication. An inexpensive game that I decided to try recently was the Catan Dice Game . For all of you that were complaining that The Settlers of Catan didn't have nearly enough dice rolling (oh, wait, I haven't ever heard that), Mayfair games has finally fixed that problem. In the Catan dice game (which can be played either solo or with friends all competing for the highest score), each round consists of players rolling the dice trying to build various items. The things that can be built include settlements, cities, roads, and knights. And, like in the original Settlers game, each of the settlements, cities and knights must be connected via roads. On each turn, you have three total rolls, and you can keep any number of dice from one roll to the next. At the end of 15 turns, whoever has the highest score wins (or in solo play, you attempt to defeat your previous high scores). The Catan Dice Game is essentially a theme based Yahtzee. The only difference is that instead of having certain things that you could only use once, you have several different things that you need to roll repeatedly (like the combination for roads). In fact, you will be building tons and tons of roads - if you don't build the roads, then you won't be able to build any of the other items (because you won't have them connected, just like in the original Catan). 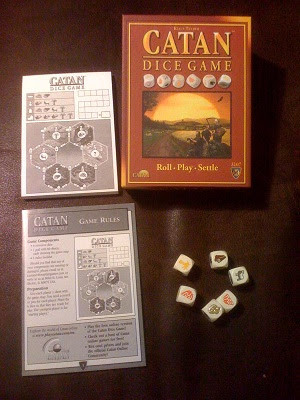 With that said, there are a couple of useful changes to the Catan Dice Game that distinguish it from Yahtzee. First of all, the knights act as a "resource joker" which allows a one-time per game resource change - this gives the player some decision making as to whether they should build the knights, and when they should use the resources. The other change is that there are "gold" resources - if you roll two gold, then you can trade that in for any resource of your choosing. Those are really the only useful differences from any other die rolling game. It is hard for me to write a pro and con section for this game, because it is such a simple game. How much can you say about rolling dice? It is useful for when you have a few minutes to spend and not much else to do. It is also useful that it requires very little concentration, and thus can be played while watching television, or during most anything else, but aside from that, there's not much else to say. Overall, I give the Catan Dice Game a 6.0/10. I didn't expect to like the game very much, but it was more fun than I expected (I didn't expect much). I think it's about on par with Zombie Dice (which for some reason I gave a 6.5 to. Who knows what I was thinking that day - I told you that I might change my mind about my reviews) or Yahtzee. When you're in the mood to throw dice, most any of them will work - pick your favorite theme, and go with from there. If you like dice games, you might also check out Liar's Dice, Martian Dice, and Cookie Fu. The most pleasant surprise I have had in quite a while was when I tried out Hey! That's My Fish! (which also has a deluxe version with cooler penguins by Mayfair here ). Now for the pros. Let's start this off with a little honesty. Who really cares what games are kid friendly? People with kids. Since I don't have kids, I've never really put much stock into this - I've paid much more attention to whether I think the game is fun than if a young child could play it. But, alas! other people have children, and they seem very concerned with this topic. Well, Hey! That's My Fish! is the best game I have ever played at truly being appropriate for "all ages." I have played it with people ranging from 4 years old to a CEO of a local technology company. And they all enjoyed it. I don't know that I can really list any bigger pro than that - if everyone from all ages likes the game, shouldn't you have already decided you need to buy it (or at least play it)? Especially since it costs about $12. The next pro is that the game has enough strategy and modularity that it has several metric tons of replayability. The board is completely modular. You can setup the different hex tiles in any configuration that you want, and each configuration will cause players to have to adjust their strategy. 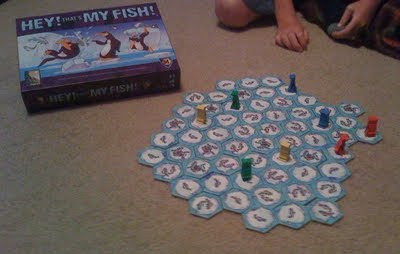 If you want, you can try putting all of the 3 fish tiles in the middle, you can try multiple glaciers, you can try a single glacier with a large cave in the middle, or anything else that you can imagine. And as I said before - however you setup the board will force players to have to adjust their strategy, thus giving the game depth. The only real con that I can call out for Hey! That's My Fish! is that it is a bit fiddly. Since you are removing hex tiles each turn - often from the middle of the board - the board gets bumped quite a bit. This isn't too bad if you play with people that are careful, but if you play with people that are careless, you can quickly have your map destroyed - and then you'll be left wondering what a "straight line" is. Overall, I give Hey! That's My Fish! a 9.5/10. Yeah, it really is that good. And it's cheap, too. So there's no real excuse for not buying it. Unless penguins haunt you in your dreams. If you enjoy spatial movement games like this, you might also check out Gipf, Pentago, and Zertz - of course none of them have penguins. A new dexterity based board game that I got to try out was Micro Mutants: Evolution . In Micro Mutants, each player takes on the role of a different type of microscopic race of bugs that is trying to take over the world (and for now must defeat the other races). Each turn, you roll two dice which determine what types of units you can move. From here, you take the "shooter" (a small rectangular plastic piece) and use it to "shoot" one of your pieces that corresponds to each unit type rolled. This is done by pushing the shooter down on the edge of one of your bugs (which is also made of plastic), which causes the unit to jump across the table. If your unit lands out of play, you place him back in his original position and his movement is forfeit. If, however, you are able to land on top of one of your opponent's units (or bases), then you are able to destroy it (it actually takes two hits to destroy a base). Once a player has destroyed two of his opponent's bases (or all but two of his bugs), he has won the game. Before getting into pros and cons, I must confess - this is not my normal style of game. I truly enjoy the strategy aspect of board games, and this doesn't really fit into that mold. With that said, I will try to be fair to the game and base the pros, cons and, ultimately, the score on what I feel the game was designed to be, instead of comparing it to something like Puerto Rico and saying "oh, the game wasn't strategic enough." The first pro that I found in Micro Mutants was that the four races were actually different and well conceived. Depending on which race you played, you will have a different breakdown of pieces at your disposal and they will also have different abilities. This even reaches out to the race's powers - if you are the flyborgs, you will have different abilities that you can unlock than the usarthropods. It is nice to see that the game designers didn't stop themselves at creating simply a mechanic, but also developed the races so that each could stand on it's own. My main con for the game is that I wasn't a big fan of moving the pieces using the shooter and the fine tuned aiming that was required. Again, I am not a huge dexterity game fan in the first place, but I believe that there is a role for them in the gaming community. Personally, I enjoy playing Clout Fantasy , but the way Micro Mutants played, it seemed to force players to be much better at the dexterity portion of the game than Clout. Personally, I prefer to have a little more leniency in how close I am to the pieces that I am trying to destroy, and a little more importance placed on who I try to attack and when. In Micro Mutants, the winner is almost 100% based on which player is better at shooting their pieces, and not based on which player was more strategic about their movements. (Yes, yes, I said I wasn't going to whine about the game not having enough strategy, but I did anyway. Oh well.) To me, if I am going to play something that is simply a dexterity game, that is what sports, washers, bean bag toss, etc, etc, are for. Overall, I give Micro Mutants Evolution a 7.0/10. I think it was a fun little lighthearted game, but definitely won't be a game for everyone. If you enjoy the mechanic of jumping pieces with the "shooter", then this game will provide you with tons of (microscopic) fun. If that doesn't sound like something that is perfect for you, you'd probably be better off staying away.